New report reveals a 23 year long pause in stratospheric temperature | Watts Up With That? The report’s author, Emeritus Professor Ole Humlum of the University of Oslo, also reveals that the atmosphere is still not behaving the way most climatologists say it should. The GWPF’s State of the Climate 2017 report is a comprehensive review of the global climate, covering land and ocean temperatures, sea ice, sea levels, snow cover and tropical storms. At the end of 2017 the average global surface temperature was dropping back toward levels before the record 2015-16 El Niño episode. This return to pre-El Niño levels underscores that the recent peak in global temperature was caused mainly by this oceanographic phenomenon in the Pacific. Data from tide-gauges all over the world suggest an average global sea-level rise of 1-1.5 mm/year, while the satellite-derived estimates suggest a rise of more than twice the rate of about 3.2 mm/year. The noticeable difference between the two data sets still has no broadly accepted explanation. March 27, 2018 in Climate News. I have been saying for four years that we should be looking at TLS for clues about long term change, since there is less climate “noise” and confounding variables. Glad to see it’s getting some traction. I think the record shows it is clearly related to major volcanic events rather than Stephen Wilde’s solar hypothesis. The volcanic effects are just disturbances in a separate background trend. I wonder where the missing heat is hiding this time? Nah, it’s in the Sun. 2) climate captains went through the quite usual practice of listing more soldiers than actually present in their company. And the general reviewing the troops is fine with that, as he, too, wants to show how formidable army this is. AKA : there never was “missing heat” in the first place. Exactly. That is the problem of adjusting data. Now nobody knows where the heat went, In fact the heat was never there. It will be “the deep oceans” again. A laughable claim, but it really is the best they’ve got. EBAF, energy balanced and filled. That “objective constrainment algorithm” wat dunnit. Dun buried Mr. Trenberth’s travesty in the ocean, where conveniently, the uncertainty is enormous. That might even not be wrong. The heat isn’t missing, it never got here. EUV is what heats the stratosphere and results in its expansion or contraction. That’s why the Tiangong space station hasn’t reentered the atmosphere as soon as they thought. The solar activity over the same time period does correlate well with low temperature in the stratosphere. Olé Ole! a very good report. 1. CO2 is plant food, and greater atmospheric CO2 is good for natural plants and also for agriculture. 2. Earth’s atmosphere is clearly CO2-deficient and the current increase in CO2 (whatever the causes) is net beneficial to humanity and the environment. 3. Increased atmospheric CO2 does not cause significant global warming – regrettable because the world is too cold and about to get colder, imo. “These are the true facts”. I somewhat agree with the criticism. and I am a professional nitpicker ! You may notice that when someone else (e.g Bill Illis, Christy and McNider) previously published analyses that I later publish, I give them credit. The fact that CO2 is proven to lag global temperature T by ~9 months in the modern data record means that climate sensitivity to CO2 can still be a positive number, but must be a very low value, far too low to cause dangerous global warming. Temperature is probably not the only significant driver of increasing atmospheric CO2 – other drivers such as fossil fuel combustion, deforestation etc. probably also contribute and predominate, but that does not change my argument.. Even if increasing atmospheric CO2 does drive global temperature a finite amount, the clear signal (dCO2/dt vs T) in the data survives, which means that temperature (among other factors) drives CO2 much more than CO2 drives temperature. If this were not true, the aforementioned dCO2/dt vs. T relationship would not be apparent, yet it clearly is. In summary: Until the future can cause the past, there is NO real global warming crisis. This fact was proved in 2008, and has been largely ignored for ten years, and yes, I am complaining. Why? Tens of trillions of dollars of scarce global resources have been squandered on the global warming scam, enough money to corrupt countless politicians, government officials and academics. The result has been an avoidable huge increase in electrical costs, the destabilizing of electrical grids due to intermittent wind and solar power, and the suffering and premature deaths of millions due to dysfunctional energy policies. In addition to the corruption of science, the many trillions of dollars misallocated in the global warming scam could have been used to alleviate enormous human suffering and save millions of lives. It is long past time that the scientific community stopped this charade, and soundly condemned and ended the ~35-year old global warming scam. “I don’t know that, and make no predictions about the future climate, because I believe it can’t be predicted”. My (our) 2002 prediction of imminent global cooling was derived from a conversation I had with Paleoclimatologist Tim Patterson of Carleton University, based on his lifelong research. Tim only took a few seconds to answer my question, so he should be given the-benefit-of-the-doubt. 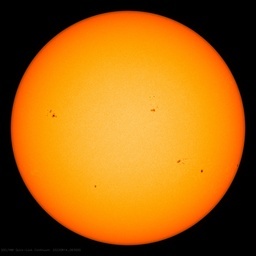 This global cooling prediction is based on the current decline of solar activity, which is contentious because some scholars say the solar activity does not vary enough to impact climate. The empirical evidence from the Maunder Minimum and other solar minimums suggests otherwise – we will soon see. I will confirm. Allan was the very first person to note this lag of the CO2 growth rate to temperature. Allan, if you have such an air-tight case, why don’t you publish it in the peer-reviewed journals? What good does it do here? You would, of course, need to show how your argument is better supported than competing arguments, so you would have to do a thorough literature review and understand the other arguments without simply dismissing them. But that is the way science is done. Anyone can say, “These are the true facts,” and list a bunch of opinions. Anyone can say, I don’t believe those arguments because they are politically motivated, and go on to reason through political motivation. You consistently mix science with politics. You are biased, Allan. You see it all through that lens. Who are you to say what is a scam and what isn’t? I’m not attacking you, it’s a valid question. Why is it impossible that the scam lies elsewhere? To consider that question honestly would be the sign of a true skeptic. No skeptic would assert a list of “True Facts” or dismiss other research without understanding it. That’s denial, the enemy of honest intellectual pursuit. I’m not trying to single you out, this is just something is a lot, a common habit. Even this, that looks so obvious on the surface, has permutations that I don’t think you understand. What do you know about plant physiology and long-term impacts of increased CO2 on the whole diversity of plants, not just as individuals, but as part of ecosystems? That includes what eats them, pollinates them, the water table, nutrient cycling and use…interactions that can’t be boiled down to an easy answer. I don’t know much about climate, but this is something I do know about. And the answer is, no one really knows all the effects of CO2 fertilization in natural communities. They are learning, but it’s a complex issue. Nitrogen appears to play an important part. I won’t go into it here. What alarmists are “making the opposite claim” and saying increased CO2 is bad for plants? It’s mindboggling. Kristi – your comments are not worth addressing – you are just arm-waving and bullsh!tting. Does this look like spurious correlation to you? It is a plot of the rate-of-change dCO2/dt versus global temperature. Then read Humlum et al 2013. Do some real work, say something intelligent, and then maybe I’ll comment. Is Mauna Loa recognized as the Global CO2 profile ? The Mauna Loa CO2 profile reflects an atmospheric transport process timing, not the time of CO2 release to the atmosphere. Hence the symmetric nature of the profile. NO, there are many sites globally where CO2 is measured and there is a calculated global average – however , the Mauna Loa CO2 concentrations happen to be close to the global average. In my Jan2008 icecap.us paper, I used the global CO2 concentrations back to 1980 and both surface temperatures (Hadcrut3 ST) and satellite Lower Troposphere temperatures (UAH5.2 LT). Note the seasonal amplitude of atmospheric CO2 concentrations range from ~16ppm at Barrow Alaska down to ~2 ppm at the South Pole. I subsequently reran the same analysis for Hadcrut3 ST’s and Mauna Loa CO2 concentrations back to 1958 and found a similar dCO2/dt vs temperature relationship. No, I’m perfectly serious and my concerns are legitimate. People have no humility these days. It’s as if I thought i could do research on political effects of trade deficits after reading a couple books about Keynesian theory. This is not some trifling issue. It’s about groundless, erroneous assertions made about science with the result that the skeptic community is wasting enormous amounts of time exploring data that has already been explored by those better equipped to know what to do with it. It’s about pseudo-science being accepted as the real thing for political reasons – and because of decades of propaganda. (I know, you say the exact same thing about AGW “alarmists.” Where is the documentation of detailed plans to deceive the public?) . I’ve seen Humlum’s work before. I wasn’t at all impressed, and his research been widely discredited for methodological reasons. Perhaps you should stick to researchers with better reputations in the field if you don’t want to be misled. If these results are well-justified then they should surely compel a fundamental scientific shift in paradigms regarding both atmospheric greenhouse warming mechanism and global carbon cycle. However, the presented work suffers from serious logical deficiencies such as, 1) what could be the sink for fossil fuel CO2 emissions, if neither the atmosphere nor the ocean – as suggested by the authors – plays a role? 2) What is the alternative explanation for ocean acidification if the ocean is a net source of CO2 to the atmosphere? Probably the most provocative point of the commented study is that anthropogenic emissions have little influence on atmCO2 concentrations. The authors have obviously ignored the reconstructed and directly measured carbon isotopic trends of atmCO2 (both δ13C, and radiocarbon dilution) and the declining O2/N2 ratio, although these parameters provide solid evidence that fossil fuel combustion is the major source of atmCO2 increase throughout the Industrial Era. We show that these conclusions stem from methodological errors and from not recognizing the impact of the El Niño–Southern Oscillation on inter-annual variations in atmospheric CO2. Their use of differentiated time series removes long term contributions. This conclusion violates conservation of mass. Further analysis shows that the natural contribution is indistinguishable from zero. The calculated human contribution is sufficient to explain the entire rise. Stumbled on this, too. Only read the abstract, so hard to evaluate it, but it demonstrates that researchers address lag rates and have come to different conclusions. Why don’t you do some real work, and read the range of literature available rather than favoring contrarians and dismissing others? How can you make an informed decision? I’ve read plenty of work by contrarian scientists and others who claim to be able to judge climate research (economists, policymakers)… and that’s one reason I go with AGW. When you mention “the symmetric nature of the profile” I wonder if you may be referring to the annual cycle of atmospheric CO2. Allan’s woodfortrees plot appropriately removes the annual cycle so that the annual growth rate can be seen. You can check this by constructing your own version of his plot (remove the temperature data and the mean and derivative steps, which will then show the annual CO2 cycle, and then add the mean:12 step back in). It is worth noting that the characteristics of the annual growth rate at Mauna Loa are also seen at other locations. Below I show the equivalent plots for Mauna Loa and South Pole and the synchronous nature of the two datasets is pretty remarkable. There is certainly no evidence of delay between the two, especially for the 1997-1998 El Niño, so the time lag identified by Allan applies equally to both locations. Please feel free to do your own analysis of the data. Thank you for your input. I just have two questions for the moment. Good point. Please explain why δ13C shows that the incremental CO2 has (and has had) a δ13C of -13 per mil since the LIA. You then state: “We show that these conclusions stem from methodological errors and from not recognizing the impact of the El Niño–Southern Oscillation on inter-annual variations in atmospheric CO2”. So what am I missing here? ENSO leads to changes in global atmospheric temperatures which leads to changes in rate of growth of atmospheric CO2. I agree, been known for a long time. So what is your point? These are one of those presumptions I’ve asked you to question. These people are activists backing in from a predetermined conclusion. The sources that you cite so trustingly are exactly those that have been corrupted – deliberately so, with agenda in mind. Opponents of these agendas are unerringly black-balled, which is one reason why your ‘published’ and ‘peer-reviewed’ sources favor the company line. This is all documented – Climategate was in no small part about the gaming of the peer-review and publishing process. We also just finished eight years of an administration whose policy on a variety of issues was ‘if the data doesn’t support your position, change the data’ – and they did. Stop being so afraid. I guarantee you, twenty or thirty years down the line, you’re going to realize that – just like the last twenty or thirty – NONE of these scary scenarios will have come to pass… and there will be a new generation of targeted youngsters being filled with scare stories about some vague point in the future and the real cycle – one of exploitation – will begin again. It is not my job to educate you. You cannot even be bothered to read what I write before you shoot-from the hip with your latest diatribe. BTW, the critiques that you quoted of Humlum et al from Science Direct are nonsense – the usual religious dogma from the Church of Latter-Day Global Warming. Jim Ross, Joel Snider and Bill Illis – thank you for your excellent comments. Really? Tens of trillions? May I call your attention to Willis’ recent post entitled “Congenital Innumeracy”. Whilst I agree with the sentiment, I question whether the expenditure is really quite that high. TomB – did you bother to check any numbers before you wrote your comment? My understanding is that over a trillion dollars are squandered on global warming nonsense every year now, mostly on green energy schemes that are not green produce little useful (dispatchable) energy. Global warming alarmism is now over 30 years old, so tens of trillions it is. If you have better information, please post it. Be sure to include the huge 24/7/365 direct and indirect subsidies to wind and solar power that are provided to make them appear more economic, all at public expense. Allen, that was a very important observation that dCO2 is in phase with surface temps. 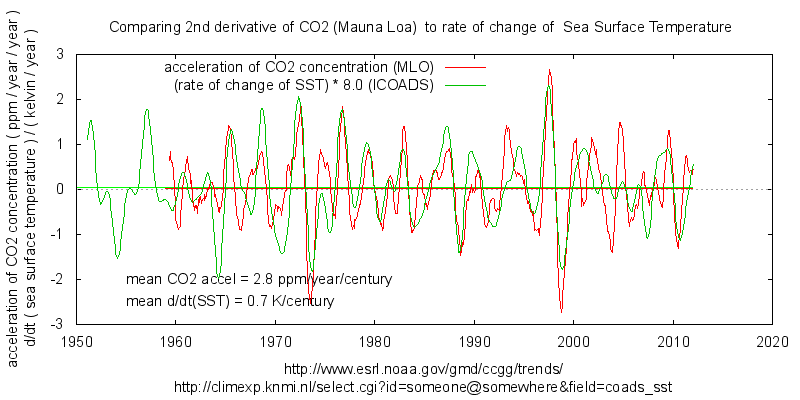 However, it dues rather brush over the underlying rise in CO2 and SST which is behind the short term variations. The phase shift of circa 9mo, is just one aspect and relates to the main short term periodicity left when the annual cycle has been correctly filtered out. There is a similar correspondence between dCO2 and SST but with a lesser scaling factor. This may be consistent with a similar effect on longer periods with a different ( lesser ) scaling. That again could be tied in to a relaxation to equilibrium which will have different scaling on different timescales. Much more effort is needed in characterising this kind of relationship to correctly asses the amount of human emissions which are absorbed and how much remains as elevated atm CO2. Filtering out the short term periodicity which gives rise to 9mo lag shows a similar correlation at longer timescaled. Higher derivatives gives similar information and allow estimation of the scaling for longer periods. Thank you Greg – I have not time now, but will try to review your comments and respond later. The total lag of atmospheric CO2 after tropical Pacific SST (Nino34 area) is close to 12-13 months. Global atmospheric temperatures lag Nino34 SST by ~4 months, and atm. 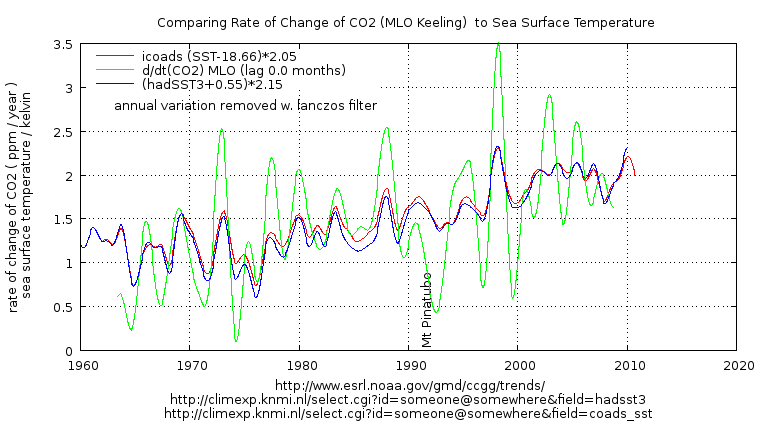 CO2 lags LT temperatures by ~9 months. Humlum says 11-12 months – close enough. It is early here – pre-coffee. Your plots of dCO2/dt are similar to mine in my 2008 paper, with a few minor changes in details. Tropical Pacific SST’s increase tropical humidity and increase tropical atmospheric temperatures 3 months later (and global temperatures one month thereafter). The huge seasonal CO2 flux, which includes seasonal photosynthesis/decay and ocean exsolution/solution of CO2, shows dCO2/dt changing ~contemporaneously with the average global temperature anomaly, and CO2 trends changing ~9 months later. I agree with you that this entire huge CO2 flux equation needs more study, Some parties are certain that their “mass balance argument” is correct, and that they understand all the major components of the seasonal CO2 flux to an adequate degree of accuracy. The discussions between Richard S Courtney and Ferdinand Engelbeen on wattsup and elsewhere were interesting. I am sitting back and waiting for the satellite CO2 data to be more fully analysed and understood. I do not expect this further understanding of CO2 fluxes will make any material changes in the observed lag of atmospheric CO2 after sea surface temperatures, land surface temperatures and lower tropospheric temperatures. Regarding your higher derivatives [d2/dt2(co2) vs d/dt(SST)], I need more time to independently recreate and review this aspect. Your wordpress link on this point did not work for me. Refreshing to see some actual climate study based on real-world observations instead of the endless parade of hypothesized BS and models. And which confirms, rather than flies in the face of, historical climate information which shows absolutely no CO2 effect on temperature. Your observations of sync-lagging also seems compatible with Stephen Wilde’s UV v Ozone regulated topopause pumping —> jetstream-wander model. Interesting observations, tah. The Global Warming Policy Foundation (GWPF) has produced a string of excellent summary reports. There is nothing comparable produced by the establishment climate alarmists, who mainly produce junk “science”. I agree with you Philip – the GWPF has produced excellent work, and the climate alarmists have produced unscientific nonsense. Global warming alarmist hysteria has reached a fever pitch, as the world cools as it recovers after the recent huge El Nino – see my above post after it clears moderation. My big question is whether we will see even further global cooling, not as a result of recovery from the El Nino, but as a result of declining solar activity in SC24 and SC25. I (we) predicted this global cooling to start by 2020-2030, in an article published on September 1, 2002, and it remains my only prediction that has not yet materialized. We wrote in another 2002 article that there was no real global warming crisis, and that the alternative energy technologies supported by the alarmists would fail to replace fossil fuels. I believe that both these predictions have now proved correct, for anyone who remains objective and adheres to the scientific method and rational economic analysis. Tens of trillions of dollars of scarce global resources have been squandered on the global warming scam, enough money to bribe countless corrupt politicians, government officials and academics. The result has been an avoidable huge increase in electrical costs, the destabilizing of electrical grids due to intermittent wind and solar power, and the premature deaths of millions due to dysfunctional energy policies and the misallocation of trillions of dollars that could have been used to improve lives and alleviate human suffering. Yep , that’s worst of all this BS. the amount of important things that could have been achieved instead of being squandered on false problems based on bigotry and zealous misplaced dogma. You might find this post of interest – on the Ban of DDT and the related Increase of Malaria. Allan, DDT has not been universally banned. It is still used in malaria control. Not before the deaths of hundreds of millions. Claims otherwise are simply apologist crap. Below is a graph that quantifies the number of DEATHS EACH YEAR FROM MALARIA – between one and two million. Note how malaria deaths increased steadily since 1980 (or earlier), after the banning of DDT in 1972, and how malaria deaths declined after DDT was re-introduced. See the red area of the graph – that is CHILDREN UNDER 5 YEARS OF AGE – FOUR AND UNDER – JUST BABIES FOR CHRIST’S SAKE! Yes I am upset. This holocaust was preventable, and easily so. See the red area of the graph (above) – that is THE NEEDLESS DEATHS OF MILLIONS OF CHILDREN UNDER 5 YEARS OF AGE DUE TO THE 1972 BAN OF DDT – CHILDREN FOUR AND UNDER – JUST BABIES FOR CHRIST’S SAKE! This holocaust was preventable, and easily so. And yes, I am still upset. When they banned DDT, the enviro-alarmists caused the needless deaths of tens of millions of people, mostly children 4 and under. The banning of DDT in 1972 was based on lies – false, exaggerated science and false politics – the politics of “feel good” rather than “do good”, what we now call “virtue signaling”. And the parallels of the 30-year DDT ban to global warming alarmist falsehoods are obvious. The global warming scam is now more than 30 years old, and is starting to unravel, as it becomes more and more obvious to the average person that the world is not getting dangerously warmer, despite rising CO2. Well-educated, objective scientists knew that global warming was a false crisis in the 1980’s, and when they spoke out against warmist lies they were persecuted in an organized attack by leftist thugs. The corruption of major scientific organizations, of major scientific journals and of science itself is unprecedented in modern times. It is long past time to bring science back into the realm of objectivity and truth – it is long past time to restore the scientific method. Not global, but it bears a remarkable resemblance to Lysenkoism in the old SU. Science is never “settled”. When a person claims this it shows they don’t have an argument, because such a claim is merely a rearrangement of “shut up” – which always indicates the person cannot defend their position. The Scientific Method rejects science as “settled”, only that a hypothesis has not yet been rejected. As I have said all the basic premises AGW theory has been founded on have failed to come true from the lower tropospheric hot spot , to a more +AO/NAO, to a decrease in OLR, and now it looks like the stratospheric cooling is not happening. When the basic premises a theory is built upon fail ,I would say the theory has failed. not if you are playing ‘heads you lose , tails I win’ which means everything can be take as ‘proof’ and nothing can disprove your claim . it is not science but then this is not a question of science in the first place. I agree. No correlation between CO2 and temperature at all on geologic time scales (Geocarb reconstructions), and temperature driving CO2 on shorter time scales (ice core reconstructions), with temperatures beginning their RISE when CO2 is at its LOW point and starting to FALL when CO2 is at its HIGH point, all of which adds up to CO2 isn’t “driving” jack sh!t. Never has, isn’t now, and never will. First smoke from a boiling kettle. Exactly, every sharp global temp plunge into the next glacial, occurs even as CO2 is holding consistently high, and CO2 falls only hundreds of years after the cold climate is already iceing up the Earth, for centuries already. I wonder why this single damning observational fact is continually ignored? Well, because it falsifies the whole CO2 greenhouse debarcle, at a glance. But we’ll just all agree to ignore the obvious falsification of both AGW, and also the “CO2 as climate-driver” theories, and slog on with the hysteria and alarmism agendas instead. Yeah? … and to what end? Anyone pushing ‘AGW’, or “CO2 as climate-driver” theory, is a fraud, a liar, a subverter of science, politics, economy, society and civilisation. This is why they invented “extreme weather”, and have to keep pounding on peripheral issues supposedly caused by “climate change”. Most of these “issues” are either greatly exaggerated or non-existent, except in the over-active imaginations of Warmists. With the Pause coming back longer than before, they will once again be trying to first deny that it exists, then trying to “explain” it away. Popcorn time. Or adjust the historical temperatures once more. The Earth constantly wants to send the heat absorbed from the Sun into outer space.. constantly. The whole climate debate is about what are the mechanisms that retard or delay this? Unfortunately for the AGW crowd, they have their entire argument based on just one: CO2, which really doesn’t make a lot of sense anyway when you look at all the other mechanisms in place that interact with each other. Throw in the oceans and cyclic changes in the Sun and it even makes less sense. So we get to the up is down and down is up arguments as the last gasp of the insanity is coming to an end. I suspect that should be “Most of these “issues” are greatly exaggerated because the Warmists’ salaries depend on keeping the climate change sc@m going”. Indeed a lot of piggies are riding on the back of AGW , like the IPCC, without it their world would ironically be a lot colder . l a little better about their failure. Major AMO peaks in 1998, 2010, and 2016, following stronger El Nino episodes. We also had a fairly large AMO peak the last half of last year which has now significantly declined. I believe both October and December were monthly record highs. Although AGW is highly exaggerated I think it’s deceiving to say that the recent warming is only due to El Nino, it’s just wrong. The 1998 El Nino was of the same magnitude, there has been significant warming between between the El Nino peaks, 1998-2016. Denying this only shows that you are as bad as the alarmists. I does appear that the warming ended almost immediately after the 1998-2001 ENSO activity. Keep in mind it’s too early to tell if we will have a similar jump in temperature this time. 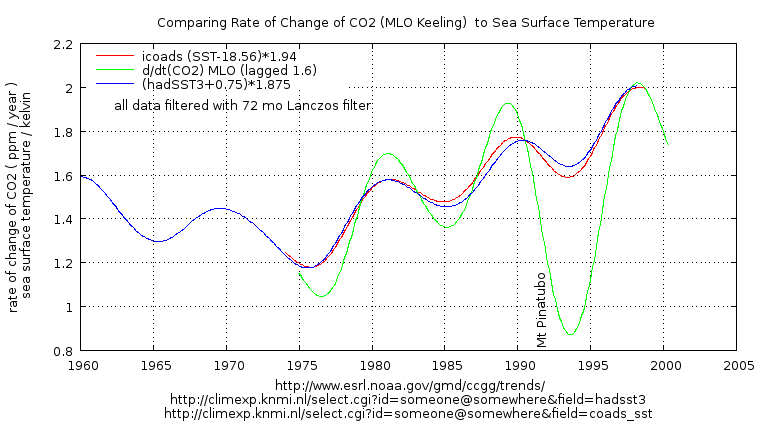 But for now it appears there’s a long pause in SSTs when ENSO is factored out. I will probably show my ineptitude, but if you are comparing two peaks on a chart such as UAH, to me, that’s comparing weather. 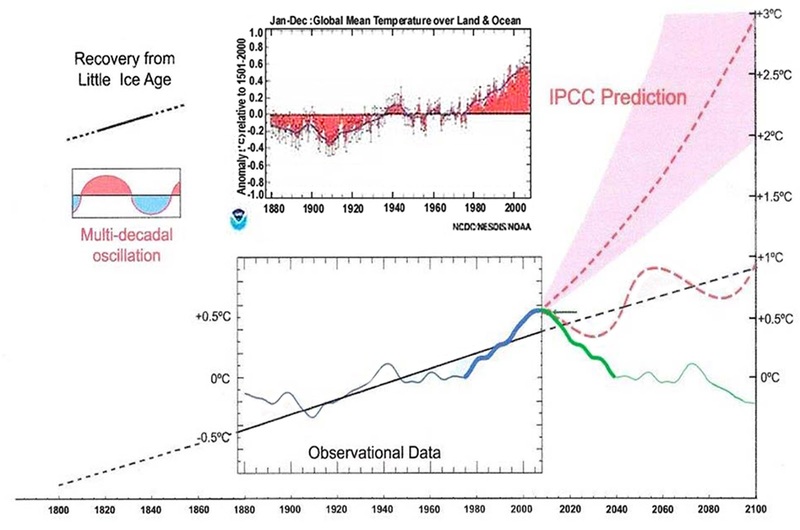 If you integrate and look at areas under the curve, that’s tending toward climate as the time frame is expanded. We should wait for the latest El Nino to work itself out before determining if “significant” (and I was taught to not use the word “significant” unless in a statistical sense) warming has occurred since the the mid 90s. The wait should not last much longer. I should add an appropriate regression analysis for determining a trend. What warming? 1995 to about 2016 was the time of the great pause. The latest hadsst3 data shows global sst temperatures are now below the pre El Nino trend. The RSS cooling trend in Fig. 1` was truncated at 2014 because it makes no sense to start or end the analysis of a time series in the middle of major ENSO events which create ephemeral deviations from the longer term trends. By early 2018, the strong El Nino temperature anomaly had declined rapidly. The cooling trend is likely to be fully restored by the end of 2019. For the longer range forecast Fig 12 from the link above. I must say, that line on your first chart is a truly impressive example of cherry picking. Referring to the chart, might want to compare your imagined current descent into cooling to what occurred around 2007 relative to 1998 and in the nine years that followed. Slipstick All scientific interpretations are cherry picked to illustrate the authors hypotheses. 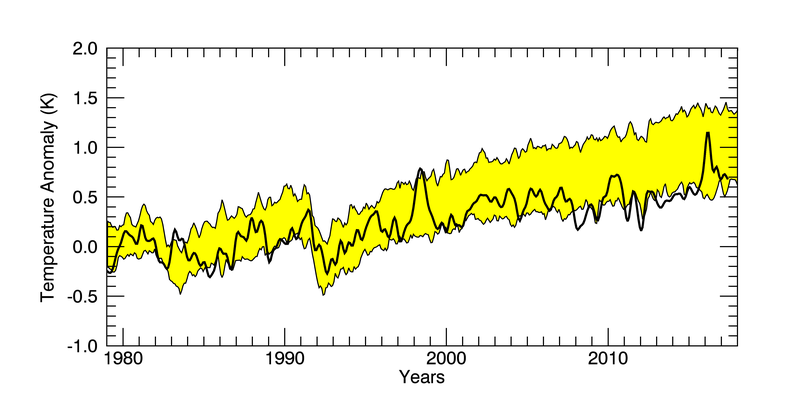 I pick mine to illustrate the solar driver – temperature relationships,based on the correlation between the solar activity 1991 peak ( low in the in the gamma ray count) and the 2004+/- sst trend change .There is a 12/13 year delay in the temperature change because of the thermal inertia of the oceans. 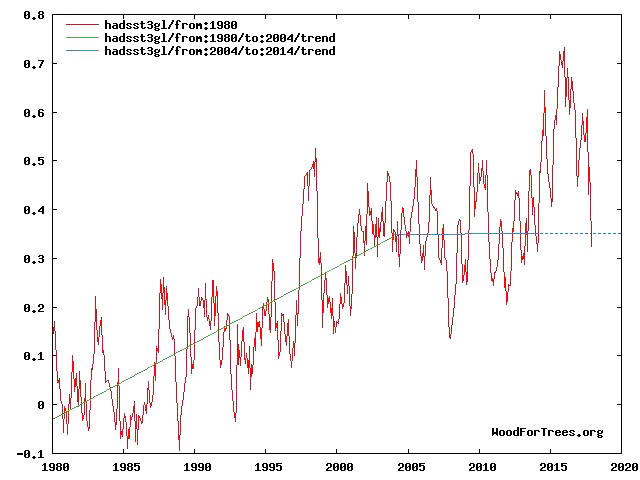 As I said above “The RSS cooling trend in Fig. 1` was truncated at 2014 because it makes no sense to start or end the analysis of a time series in the middle of major ENSO events which create ephemeral deviations from the longer term trends. ” A trend from 1998 – 2007 is meaningless. Here is another Humlum Figure showing the millennial turning point very nicely. It took longer to get to this level than it historically has done so. Maybe a whole year late. But then, we don’t really know what is going on with temperatures anymore. They are mucking around with it so much right now that no one knows anymore. Just look in your backyard instead. Satellite and surface station trends diverge because the latter are cooked books. 1. I have had a look at your work at JoNova’s blog, and am impressed. However, you and Kristian disagreed in some of the Comments, and I would like to resolve those difficulties. Internal energy of a gas is basically composed of the translational and rotational kinetic energies of the individual gas molecules (quantum jumps between vibrational energy levels are high enough that at 288 K or lower, almost all gas molecules are frozen in the lowest vibrational state). This is unchanged if the gas is physically lifted up in the Earth’s gravitational field (Kristian is right on this point). By the Law of Equipartition of Energy, each degree of freedom would acquire RT/2 per mole of gas. For 3 translational and 2 rotational degrees of freedom for a linear molecule (e.g. N2, O2, CO2), this means internal energy would be 5RT/2 per mole, or 5kT/2 per molecule, where Boltzmann’s constant k is equal to the Ideal Gas Constant R divided by Avogadro’s Number (the number of particles in a mole). 2. However, as altitude increases, pressure decreases, so volume increases (Boyle’s Law). The work done in expansion means temperature of the gas would decrease. To understand this, imagine a flat plastic freezer bag containing molecules considered as point particles with a certain internal energy. As the molecules collide with the internal walls of the bag, they push outward, expanding the volume of the bag. At constant pressure P, the work done in creating a volume of dV would be PdV, and at final volume V, the work done would be PV. For an Ideal Gas, PV = RT for one mole (n=1), so the enthalpy (heat content, H) is 7RT/2 per mole, or 7kT/2 per molecule for linear molecules like N2, O2 and CO2. Enthalpy (heat content) includes the RT needed to warm up the contents of the freezer bag to temperature T at constant pressure P.
3. The heat capacity at constant pressure, Cp is the derivative of H with respect to T. I.e. Cp = 7k/2 per molecule for linear molecules. See https://en.wikipedia.org/wiki/Heat_capacity for more details. 4. In the Earth’s troposphere, gas molecules also possess gravitational potential energy U = mgh , where g is the acceleration due to gravity, and h is the altitude. 5. If no heat is added to gas molecules from an external source (i.e. change is adiabatic), then as gas molecules rise in altitude, they must decrease in enthalpy (heat content). I think this is your argument, Stephen, although you confused enthalpy with internal energy (this is the point at which second year university students taking Physical Chemistry get lost and tune out). I.e. dU/dh = – dH/dh . 6. By applying the Chain Rule for derivatives, dH/dh = (dH/dT)(dT/dh) , and when one substitutes for U=mgh and H = 7kT/2 , one can readily derive the dry adiabatic lapse rate of -9.8 K/km (we have not included water vapour). See https://en.wikipedia.org/wiki/Lapse_rate . 7. By including the heat absorbed by greenhouse gases in the troposphere, I can derive the observed lapse rate of -6.8 K/km to within 2% accuracy (email me at rtaguchi@rogers.com and I can send you pdf files). 8. Both dry adiabatic and observed lapse rates show that temperatures decrease linearly with increased altitude due to decreasing H as altitude h increases. Greenhouse gases decrease the rate of cooling, but are not the CAUSE of decreasing temperature (the global warming literature is wrong on this point). 9. Ozone molecules created by incoming Solar UV radiation in the stratosphere absorb some UV wavelengths strongly, and during inelastic collisions with air (N2 and O2) molecules, excited ozone molecules transfer energy to translational and rotational modes of the departing molecules. I.e. the stratosphere warms up. 10. BTW, this is the same mechanism by which a tiny (0.04%) concentration of CO2 molecules and water vapour molecules absorb infrared (IR) energy emitted from a warm solid and liquid surface of the Earth, and transfer energy to N2 and O2 which as non-polar molecules cannot and do not re-emit any significant IR to outer space. So the troposphere warms up (the greenhouse effect). The energy imbalance caused by net tropospheric absorption means that the same incoming Solar visible radiation warms up the solid and liquid surface of the Earth until the T^4 Stefan-Boltzmann law restores energy balance, at a slightly higher surface temperature. Yes, the CO2 and water vapour molecules also store enthalpy (heat content), but N2 and O2 outnumber CO2 by 1,000,000:400 = 2500:1, so they store 2500 times the enthalpy as CO2 (since the heat capacities per molecule are the same 7k/2). 11. As the stratosphere warms up (during your Active Sun phase), expansion downwards causes the troposphere to fall. So the rest of your theory follows. I’m not sure if more or less ozone in the mesosphere is important in explaining the greenhouse effect in the troposphere and stratosphere. 12. BTW, IMO the general circulation of major currents is explained by the centrifuge effect and the Coriolis Effect. The rotating Earth is a centrifuge, so warm, less dense surface water at the Equator is driven toward the poles. But in the Northern Hemisphere, the Coriolis Effect deflects this motion to the right. This explains the flow of the Gulf Stream and the Japan Current (Kuro Siwo). In the Southern Hemisphere, the Brazil Current flows from Equator southward, but is deflected to the left. As water is relatively incompressible, these flows must be balanced by flows of cold water in the opposite direction. This explains the southward California Current which is deflected to the right, producing an overall clockwise rotation of surface water in the Northern Pacific. Similarly in the Northern Atlantic, the Canary Current completes the clockwise circulation of surface waters. In addition, dense cold Arctic salt water is driven by the centrifuge southward toward the Equator, with the Coriolis Effect deflecting the flow until it hugs the eastern coast of North America. 13. In the Southern Hemisphere, deep cold water is driven toward the Equator by the centrifuge, creating the upwelling Peru (Humboldt) Current in the Southern Pacific and the Benguela Current in the Southern Atlantic. Both of these are deflected to the left to complete the circulations. The upwelling Humboldt Current brings up nutrients from the deep which increases the plankton and the anchovies, etc. 14. The remaining mystery is what causes the reversal of flow during El Nino events. I speculate that somehow the islands near New Zealand, Fiji, New Guinea, etc. (which represent only the high points of underwater mountains) create resistance to southward flow by the centrifuge effect (which varies as the sine of 2 times the latitude, so is zero at the Equator, and maximum at latitude 45 degrees). So the cold Humboldt current waters (which decrease the overall surface temperature of the Earth) warms up at the Equator, moves westward, but piles up near the islands. Eventually when the height is high enough, the pendulum swings back, reversing the flow of Equatorial waters during El Nino events. The damping of the cold Humboldt Current waters means the Earth’s mean temperature goes up, heralded as proof of global warming by the Climate Change activists. 15. These general principles also explain the path in Tornado Alley (low pressure cells are driven northward by the centrifuge, but deflected to the right in the flat central plains of North America where we can ignore the effect of mountains). Ditto for hurricanes, which move westward when near the Equator, but then are deflected northward and to the right in the Northern Atlantic. Sharp-eyed critics, of course, are welcome to knock holes in any specific argument, but I hope this general overview helps. Wow Roger, did writing this make you late for work? Oops, in my point 11, “troposphere” should read “tropopause”. Put simply, null hypothesis proven. CO2 up, temperature not. Note though that the active solar phase reduces warming of the stratosphere above the poles by increasing the ozone destruction process. That is the opposite of the consensus view but is supported by recent observations above 45km when it was seen that a less active sun caused warming in the stratosphere above that height by decreasing the ozone destruction process when the consensus expected cooling. The so called greenhouse effect is actually created by atmospheric mass conducting and convecting and not by GHGs but there are a lot of contributors here who cannot accept that. The opposite sign ozone response in the mesosphere is necessary to match observations of reducing polar ozone and falling stratospheric temperatures when the sun is active with more polar ozone and rising stratospheric temperatures when the sun is less active. Consensus science expects the opposite but is therefore incompatible with observations unless one introduces an alternative hypothesis which was of course done with CFCs as the proposed cause of the decline in ozone over the poles when the sun was active. I think that was an error and it was actually solar activity levels altering the balance of ozone creation/ destruction after all which is why the stratosphere stopped cooling as the level of solar activity declined towards the end of cycle 23. If the recent stratospheric warmings (the most recent has been very powerful) continue to occur and/or intensify so as to push more polar air more often into middle latitudes whilst the sun remains quiet then that would serve as proof of my hypothesis. “pause in stratospheric temperature” If the pause is recognized then we obviously acknowledge the trend itself. We have to realize that something is happening. Indeed. Like large stratosphere injecting eruptions altering ozone based two-way radiative diffusion . Followed by tropospheric adjustment over about half a decade or so. I wonder where the El Nino gets the heat that it releases periodically. Anyone know? Subterranean magma? Accumulated heat from t he sun? The sun, obviously. Core of the Earth and volcanoes are several order of magnitude smaller than the sun (Watts versus kilowatts). Does this mean you predict a tropical troposphere “hot spot” that millions of radiosondes and weather balloons have somehow failed to observe? Hi Lance! 1. No, there is no tropical “hot spot” at mid-altitudes because the net absorption/warming occurs throughout the troposphere. 2. Convection currents and winds also transport heat from hot regions to cold more efficiently than radiation (absorption followed by emission followed by absorption, etc. between greenhouse gases) alone. 3. The literature explanation of complete absorption followed by complete emission (by Kirchhoff’s Law) applies only to central CO2 frequencies (around 667 cm^-1), resulting in the “220K” emission from the stratosphere that truncates what would otherwise be a 100% net absorption (i.e. zero emission) ditch in the IR spectrum recorded by satellites looking downward. Note that the literature explanation at these central frequencies means that when CO2 is doubled, the layer of final emission to outer space occurs at higher altitudes, which in the stratosphere means at higher emission temperatures. For energy balance, this means that less emission is needed from the Earth’s surface, i.e. this would mean global cooling at the surface which is of interest to us all. 4. The reason there is a 220K emission truncation comes from the Schwarzschild Equation, which states that the Signal observed by the satellite = Io.exp(-KCL) + B[1 – exp(-KCL)] , where the first term Io.exp(-KCL) is attenuated signal after Beer-Lambert absorption and B[1 – exp(-KCL)] is the emission term. 5. (a) If attenuation is zero, exp(-KCL) = 1, and Signal = Io, the emission from the 288 K solid and liquid surface of the Earth, so all of the photons emitted by the surface escape through the atmospheric “window” to outer space. (b) If absorption is 100%, attenuation is complete, so exp(-KCL) = 0, and Signal = B, the emission from 10 km or above, where the optical density decreases enough for the photons to escape to outer space. (c) If exp(-KCL) is between 0 and 1 in the entire 10 km path length of the troposphere, it can be understood as transmittance, which can be replaced by (1-A), where A is the absorbance. Then the Schwarzschild Equation becomes Signal/Io = 1-A + (B/Io)A = 1 + (B/Io – 1)A . Since CO2 667 cm^-1 absorption peaks near the peak emission of 288 K Planck black body emission, B/Io can be approximated by (220/288)^4 = 0.341. This means the Schwarzschild Equation becomes Signal = 1 – 0.659A , which is a modified form of Beer-Lambert transmittance/absorbance, with A replaced by 0.659A to account for the emission term. This is net absorption, as any competent chemist can tell you, not net emission from a layer in the troposphere (at 5 km, for example). The literature is all wrong on this point. Chemists usually ignore the emission term, because a lab spectrometer uses a hot black body to provide the initial radiation Io, and B (the emission from room temperature) is negligible. However, for the greenhouse effect, Io is the emission from a 288 K black body, and for the first few km B/Io will be close to 1 (i.e. B is not negligible). The Signal for these partially attenuated frequencies essentially escapes to outer space at 10 km, because from 10 to 20 km there is little temperature change for most of the Earth, so there is no change in transmittance or absorbance as the density steadily decreases to the point where the photons escape unmolested to outer space. 6. The net absorption at frequencies that are only partially absorbed is greater in magnitude than the extra emission from the stratosphere at central CO2 frequencies, so doubling CO2 means a net absorption overall, a throttling of IR escaping to outer space. For energy balance, the emission from the Earth’s solid and liquid surface must increase (caused by the unchanging incoming Solar visible radiation). This explains the greenhouse effect for the surface. The recent El Nino was not the strongest one on record according to all ways of measuring it. Much of the energy from the recent El Nino was outside the regions typically used to measure El Ninos. Sorry to be a pedant, but I think it’s worth emphasizing that it is not a pause until the warming resumes. Unless and until the warming resumes, it just isn’t warming. The past few years the sun was at its worst in terms of spewing more of the most energetic particles [due to the lower solar polar magnetic field strengths] which of course affects anything [that measures something] in space. You make things far too difficult. There is no man made global warming. Just figured this out from looking in my own backyard…. It is already globally cooling…. There may or there may not be some global warming, but in any case this is not a proper metric of some enhanced greenhouse effect (if any). Were increased GHG to have any effect, it would best show in reduced heat loss rate at night, in clear sky deserts (to get rid of water effect), compared to previous decades. For some reason, no data show any such effect. Pretty sure it wasn’t even looked for. The fact is that my data sets are showing that there has been no warming in the SH over the past 40 years. All warming was in the NH. Increase in CO2 certainly does not explain my results. That takes away the G out of AGW. Come down with me 1 km down into a goldmine here. You will notice the sweat on your face and body and begin to wonder how big the elephant in the room really is. Now google how much more the magnetic north pole has been moving north east in the past 100 years compared to the century before…. Perhaps one type of SC that has a magnetic stirrer effect? For my own sanity and sense of realistic proportions, regarding the above argued AbsorptionsRe-emissions of all wavelengths of photos (with atmospheric Windows™), it is only a tiny fraction of all photons passing through the atmosphere involved in the minor absorptionsre-emissions process. If it were not an incredibly minor process, the satellites could not make clear high-res optical wavelength images of the Earth’s surface, because no photons would pass directly from surface to sensor, and nor could ground-based telescopes with adaptive-optics make clear crisp images of the planets. So the overall photon AbsortiondRe-emissions process is very tiny, else the images would be all washed out. Because the total CO2 photon AbsorptionsRe-emissions is freakin tiny. Almost but not quite nothing. In fact, H2O is the faaaar bigger photon AbsorberRe-emitter. So, were talking about photon to molecule swapping that’s so minor as to be almost inconsequential. Unless it’s >cloudy< … no satellite or telescope images then! The images really are all washed-out with clouds. But that is H2O, not CO2, that's doing that. CO2 can do nothing similar. 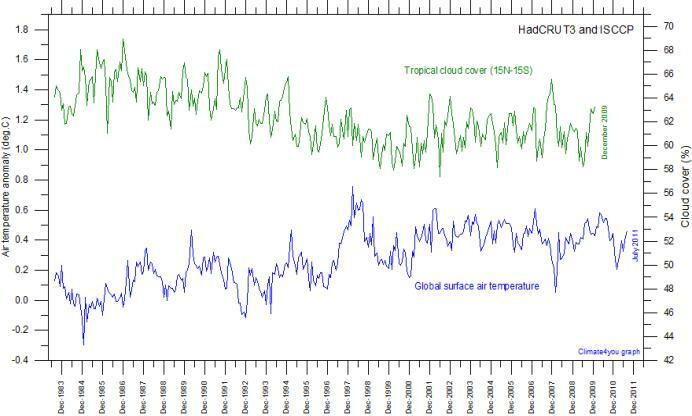 And clouds net-cool the surfsce over time, via direct H2O albedo net photon escapes to space. Which shows clouds are easily the far more significant photon Absorber re-emitter atmospheric process on Earth.